Stuart Hughes has designed the most expensive phone in the world, a $15 million dollar diamond studded iPhone 5. 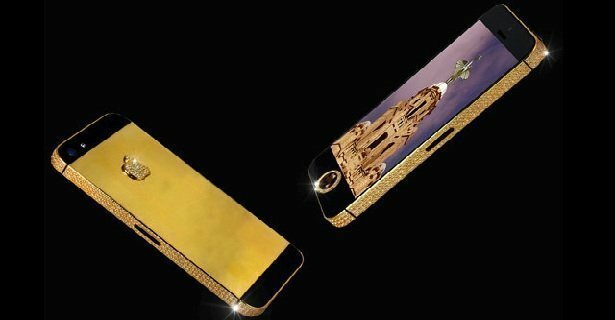 Businessman, Stuart Hughes has adorned his iPhone 5 with over 600 flawless white diamonds, dressed the rear of the phone and logo in solid gold and over the home button is a rare 26 carat black diamond. “This masterpiece boasts a massive circa of 135 grams of 24ct gold and of course, sapphire glass set in the screen.” stated Hughes website. This iPhone 5 of course supersedes his previous attempts and his new creation is believed to be worth $15 million dollars thanks to the black diamond which is individually valued at $14.5 million.